Would you like to advertise with us? Please check out our affiliate section or contact us. 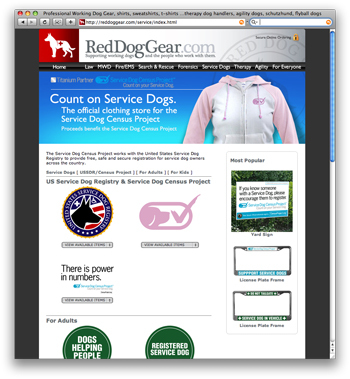 When you buy any Service Dog Census Project or US Service Dog Registry branded product at Red Dog Gear you're helping us fund this Project. In order to get the word out about the Census Project we need online advertising, direct mail campaigns, pamphlets, point-of-purchase displays and posters in breeder's and trainer's offices and even grassroots efforts by individuals and groups. Every purchase helps cover the significant costs associated with collecting important information about Service Dogs and their owners. It is a great way to help support the Service Dog community as a whole.